Wellington Labs is a small family-run operation in the beautiful hills of central Vermont. 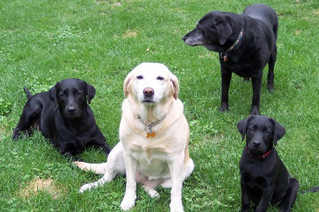 We have been breeding AKC registered yellow and black Labrador Retreivers since 1994 on a very limited basis. We pay particular interest to the genetic background of both parents to ensure freedom from hereditary problems. Our focus is on breeding a healthy and happy dog with a great disposition and solid pedigree. All breeding stock are OFA certified and CERF cleared annually and all pups are sold with limited registrations. Our puppies are raised in our home with their great grandma Connie, grandma Bella and mama Beeble. We make sure that each puppy is well-matched with his or her new family and insist on meeting your family. Please feel free to contact us for more information.